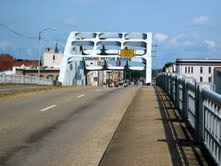 A view of the Edmund Pettus bridge facing downtown Selma. The city of Selma, Alabama is best known for its connections to the Civil Rights and Voting Rights Movements of the 1960s. Though the black citizens of Selma had been working toward equality since Reconstruction, the struggle was largely local until March 7, 1965, when approximately 600 nonviolent protestors attempting to march to Montgomery were set upon by state troopers and deputized possemen on horseback amid clouds of tear gas on the Edmund Pettus Bridge. Bloody Sunday thrust Selma onto the national stage and served as a catalyst for the passage of the Voting Rights Act of 1965.Selma’s role in this national story attracts tourists from around the world. They admire the iconic facade of Brown Chapel A.M.E. Church and walk across the Pettus Bridge, imagining what John Lewis describes as “a sea of blue.” What visitors rarely see as they trek from First Baptist Church to the downtown area, however, is the legacy of segregation etched into the cityscape. Segregation was more than law and custom; it was a way of life that embedded itself firmly in the built environment. The Burwell-DInkins Home in Selma, Alabama had an infirmary built on the rear of the property. Reading the landscape of segregation goes beyond identifying neighborhoods as white or black; it means reexamining the way we understand the city as a whole. Though Selma has been predominantly black since the 20th century, the downtown area was designed for the convenience and use of the white minority. Though blacks did patronize some businesses, black citizens also owned their own businesses, some yards from the white section of downtown, others scattered through black neighborhoods. Though few of these neighborhood stores remain open, their concrete block shells are monuments to the prosperity of a once-bustling community. The buildings downtown may be more impressive than the humble remains of a corner grocery, but are they truly more significant for understanding how most Selmians lived for the better part of a century? Beyond corner stores, homes in black neighborhoods often housed other businesses as well, including health clinics, beauty parlors and barber shops, and seamstress and tailor shops. In the days before public kindergarten, church annexes and basements housed kindergartens. Because many (but not all) black neighborhoods began as company housing, communities were often within walking distance if not directly beside the factories, railroads, and cotton gins that employed their inhabitants. If we consider the city as a human environment rather than a collection of architecture, then these pockets of commerce, tucked among single-story cottages, shotgun houses, and handsome brick churches, are the true heart of Selma, where most of her citizens lived, worked, shopped, and worshiped. The landscape of segregation creates myriad challenges for the would-be conservator. Beyond identifying sites, we need to find ways to balance the protection of resources against the changing needs of the communities to whom they truly belong, a goal best accomplished by working closely with local community leadership. In Selma, the latest effort at identifying and preserving resources has been been through the creation of a Multiple Property Submission to the National Register of Historic Places (currently under review). 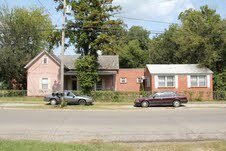 The MPS was contracted by the Alabama Historical Commission to the Center for Historic Preservation at Middle Tennessee State University, where a group of doctoral students under the supervision of Dr. Carroll Van West worked with local grassroots preservationist Louretta Wimberly to coordinate a series of community meetings to get feedback and measure support for the project. These discussions led to the development of a strategy whereby the churches involved in the movement, which are still active centers of community today, would be the focus of the first round of nominations under the MPS. Much of the momentum for the completion of the MPS and related nominations comes from the impeding 50th anniversary of the March to Montgomery and Bloody Sunday. As Selma prepares to commemorate these events, these new documents offer a roadmap for a more inclusive interpretation of the past, one that will better reflect the variety of experiences across the entire community and at a variety of institutions. Historians, preservationists, and planners need to be aware of and learn to see the different layers present in the landscape of historically segregated communities to ensure that preservation and planning are done in a way that is respectful of the past and the community. By forming reciprocal partnerships with local institutions, both community members and preservation professionals can learn from each other and hopefully find a path toward a stronger and more holistic understanding of the cultural and historical landscape. Abigail Gautreau is a PhD candidate at Middle Tennessee State University. She is a Graduate Research Assistant at the Center for Historic Preservation where she serves as Lead Investigator on the Selma Multiple Property Submission.